While taking your dog to a professional groomer to get a cut may be expensive and not in everyone's budget, using a pet clipper to groom the dog yourself is also scary for many inexperienced pet owners. But fear not – after the first one or two sessions, both you and the dog can get used to the process, especially if you follow these tips on picking the right type of best dog hair clippers and know how to use (and care for) them correctly. Clipper blades come in several different options, and they all vary based on the texture and length of your dog’s coat. For example, a Westie or Western Highland Terrier has a medium to long coat length and silky smooth, straight fur. Their fur varies from their head, to their sides, to their tail, so they’ll need a different blade for each portion of the body. This means that you can use a dog clipper blade from 5F to 7F. This guide explains more about the different types of dog clipper blades, and the pros and cons of each. Use the right blade for your dog's coat length. Figuring out the right clipper blade for your individual dog can be intimidating if you aren’t sure what you’re doing. Typically, most dog clipper packages come with a manual that explains it well, but if you're nervous, ask a professional groomer for assistance. You can also take a class on dog grooming, not just for aesthetic purposes but for safety as well, or read this extensive guide and read Samantha's guide on how to use clippers here. It’s not the most important factor in buying pet clippers for your dog, but you should know that you have the option. Rechargeable (cordless) clippers are perfect for pups who are scared, overly excited, or just flat out uncooperative because they don’t like grooming. You have a wider range of movement, and you can easily bend and turn without resistance from the cord. Here are the best cordless clippers out there. On the other hand, if you forget to plug in rechargeable dog clippers and they shut off midway through the grooming, it can be irritating. Most of the time you won’t need to switch out the internal battery, but on any “cordless” device, clippers or not, there are occasions where the battery will finally fail and stop charging. Sometimes they can be replaced, but more often than not you’ll probably have to get a whole new clipper set. Since you’re already coming at your dog with a large, buzzing object that’s cutting off bits of their fur, the first trim with electric clippers can be pretty scary (for both of you). 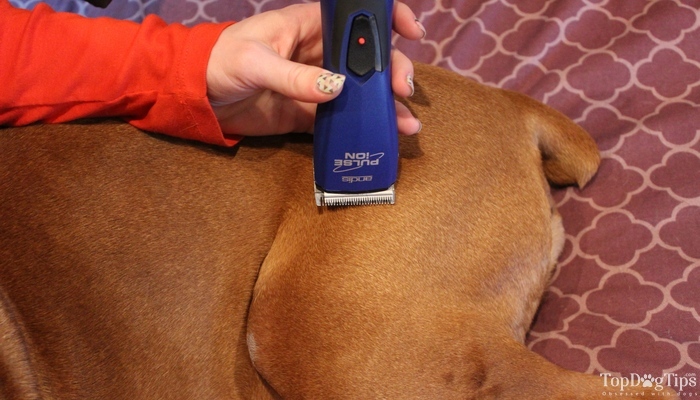 If this is your first time, watch this video guide on how to get a dog used to clippers. Before you begin grooming, allow your dog to sniff and look at the clippers before you turn them on and encourage your pet's curiosity. It makes the whole situation a lot less terrifying, especially if you can’t find a quieter brand. Let them get used to the sound, and slowly trim off a little fur. Give your dog treats and praise so that they understand that grooming is a good experience and not a scary one. If all else fails and your pup is still anxious about being groomed with clippers, you can also use silent dog clippers which are either mechanical and thus have no buzzing at all (like the Scaredy Cut clipper in the photo), or are somewhat quieter than many other dog hair clipper brands. While the machine itself is pretty simple, the mechanics behind your dog clippers is a little more complicated. The rapid movement of the metal blades produce quite a bit of heat, and as physics dictate this heat causes the metal to expand. You can’t eliminate the production of warmth completely, but you can help the dog clippers operate better with proper lubrication. Where to lubricate your dog clipper blade. Lubricating your pet clippers before and after trimming will definitely keep them from becoming too warm, dull, and keeps grit and fur from building up. It’s also been recommended to add oil during the trim, which may slow you down a bit, but it’s safer and it helps the pet clippers and the blades to last longer. If you’ve ever seen the results of a dog show or been in a groomer’s office, you’re probably already aware that there are hundreds of different dog hair cuts to choose from. A Goldendoodle can receive anything from a puppy cut, or teddy bear cut, to a lion cut, to a mohawk cut and much more, depending on how creative and brave you are. However, you’re not going to have the same looks and styles available for a Husky or a German Shepherd. A Husky specifically has a very thick undercoat that is necessary for maintaining their body temperature in both the heat, and the cold. So make sure the look you want goes with the breed that you own. When trimming your dog’s fur, you should always go in the same direction that the hair grows. 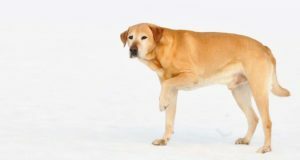 As you’re make your strokes, you should be pulling your dog’s skin taught; it shouldn’t be so tight that your dog is in pain or discomfort, but it should also not be so loose that it’s getting caught in the blades. Always cut dog's hair in the right direction. This is an essential part of safely cutting your dog’s hair. If you aren’t careful about flattening the skin and moving the blades in the correct direction, you can knick your dog or severely cut them. To get a better idea of how this should be done, you can also watch a quick video on YouTube if you don’t have access to a class or professional groomer. Never, ever use dog clippers on your dog right after you give them a bath. Wet, mangled hair will create matts that get caught in your blades. It’s painful for the dog, and it feels a lot like someone yanking the hair, and possibly chunks of the scalp right off the body. Dry your dog before using pet clippers. Once your dog is out of the bath tub, dry them off well and make sure that you brush out any knots and tangles. Use dematting tools if necessary. If your dog is comfortable with the sound of a blow dryer, dry them off on a “cool” setting; it makes the texture of their fur a little easier to brush through and cut. Don't use your own hair dryer and instead see these best pet dryers which are the most safe to use on dogs. Puppies are a handful, but they’ve also experienced a whole lot less of life than an older pup. When they’re younger, it’s easier to get them accustomed to things like being groomed and handled, loud noises, receiving commands, and getting comfortable with new objects like nail clippers and hair clippers. If you do have a puppy who will eventually need regular grooming, get them used to it as soon as you can. It makes a huge difference in the long run. Don’t mistake this as meaning that you cannot groom an older dog using dog clippers. You still can (and you should). It might even be easier than grooming a puppy depending on your dog’s personality. Some pets aren't as anxious. Regardless of age, your pet needs time to acclimate to this new experience, just like you and I. Take it slow, and don’t rush into a new cut, you’re both learning and practice makes perfect.